When we decided to visit old friends in Plymouth on our way to Europe, we didn’t realize it would be so full of surprises! 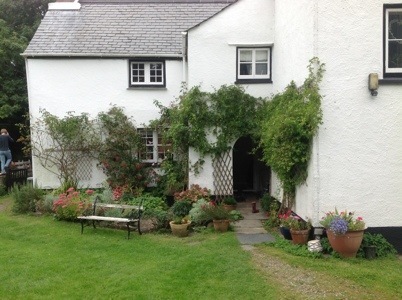 The first surprise was that they have recently started operating a bed & breakfast in their gorgeous Cornish country farmhouse, Bulland House, so instead of sleeping on a sofa bed in the living room, we had our own cozy room complete with ensuite bathroom and wonderfully comfortable bed. The girls were quick to comment on the tv, mini chocolate bars and tea-making facilities as well. And a fabulous breakfast to boot – brilliant! Surprise number 2 was Carnglaze Caverns, which, on the Internet looked like somewhere we’ve always wanted to go…amazing underground lakes and stalactites. But alas, closed on Sundays! One to remember, though, for next time. 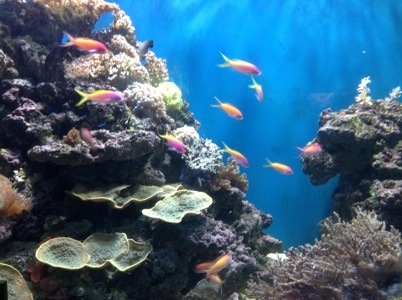 So instead, we went with surprise number 3, the National Marine Aquarium, the biggest one in Britain. 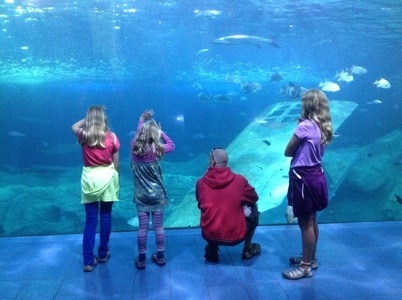 It was a fantastic afternoon out, and the girls absolutely loved it. The best thing about it is that they think it’s really impressive at the beginning when you are seeing all the marine life from Plymouth Sound, but it just keeps getting more spectacular all the way around until, by the end, you are looking up at a sea turtle who was washed up here from the Caribbean in a massive storm, and sharks are swimming over your head. Fantastic. Surprise number 4 – Thanksgiving! Well, not exactly, but you know how the pilgrims landed at Plymouth Rock? Turns out, they sailed from right here in Plymouth. 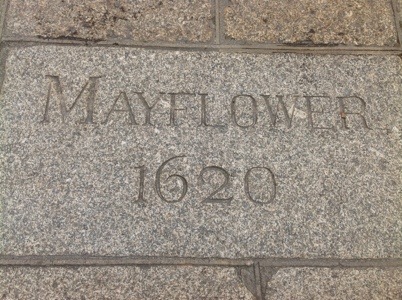 Funny how they landed in a place with the same name…anyway, we went and saw the Mayflower steps from whence they sailed. Nothing at all to do with Canadian Thanksgiving, but very cool nonetheless! Surprise number 5, Smeaton Tower, one of only three Eddystone lighthouses in the country built in the 1700’s by James Smeaton. So, an excellent day out, a great learning experience, and superb hospitality. And all we were counting on is a good catch-up with some old friends. Surprise! Sounds like you guys had a great day. Love reading what you guys have been doing. It makes me want to explore all the neat things you have been seeing and doing.